2 How the RSI Indicator Works? 2.4 How to use the RSI indicator for intraday trading? 3 RSI Zones: Comprehend RSI like a pro! 7 Which Markets Can RSI Be Applied To? 9 Other Tools To Use With The RSI Indicator? This is the ultimate guide to the RSI Indicator. Learn about how the RSI indicator works, RSI buy and sell signals, RSI calculation, RSI wiki along with trading strategies based on RSI Divergence. The RSI Indicator is a technical analysis indicator which was developed by renowned technical analyst J. Welles Wilder. This momentum oscillator compares recent gains and losses over a specific period of time to measure the speed and change of a security’s price movements. Its primary use is to identify overbought and oversold conditions when trading assets. The RSI has a range of 0 to 100 and is commonly considered overbought whenever it’s value is over 70. Values of 30 and under are considered oversold. The RSI can be used to generate trading signals by searching for divergences, centerline crossovers, and failure swings. It can also be used in identifying the general trend. How the RSI Indicator Works? Today the RSI is counted among the most popular trading indicators, and with good reason. It can be used to determine trends, time entries, and much more. Although this indicator is most widely considered overbought when it’s above 70 and oversold when it’s below 30, these levels can be adjusted to better fit the particular security being traded (whenever necessary). If, for example, a security reaches overbought levels repeatedly, you may want to change this level from 70 to 80. In fact, some traders try to avoid false signals from this indicator by using more extreme values of 80 and 20 as their trading signals. Although the traditional use and interpretation of the RSI is that values of over 70 mean that the stock being traded is becoming overbought or overvalued and that a trend reversal or price pullback may be imminent, it’s also important to note that during strong trends the RSI may be in overbought levels for extended periods of time. On the other side of RSI values, The same goes for oversold levels. The RSI indicator often forms patterns like trend lines and double tops and bottoms that may not show on the underlying price chart. It’s also a good idea to look for support and resistance on the RSI. During an uptrend, the RSI usually stays in the range of 40 – 90 with the 40 to 50 zone acting as the support. In a downtrend, the RSI often remains between 10 and 60, with a resistance zone of between 50 and 60. Of course, these values will vary depending on the particular RSI settings as well as the strength of the security’s underlying trend. If RSI is below 30, it is a buy signal. If the RSI is above 70, it is a sell signal. In the below chart you can see how the stock tanks after the RSI reaches overbought zone. In the below chart you can see how the stock zooms after the RSI reaches oversold zone. How to use the RSI indicator for intraday trading? 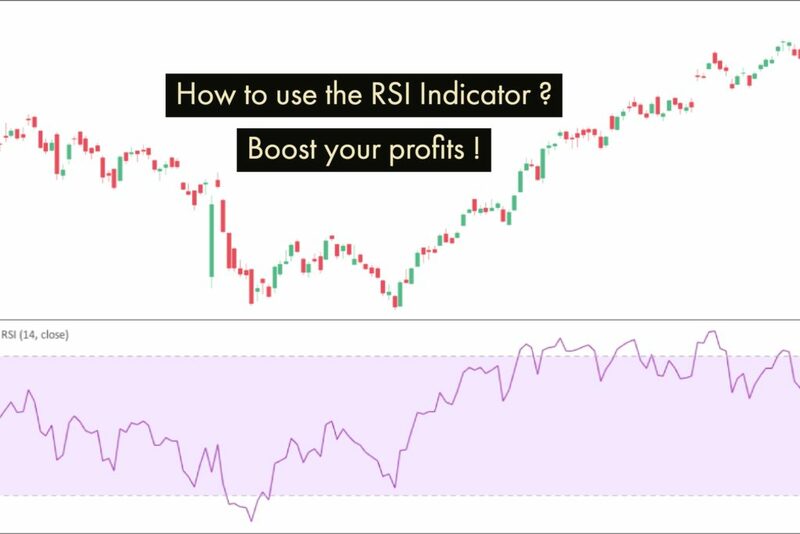 You can use the RSI Indicator in the same as discussed above by applying it on the intraday chart of 15min, 30min or any other time period as you desire. The threshold values for oversold and overbought conditions remain same. RSI Zones: Comprehend RSI like a pro! Most people think of RSI in terms of Overbought (OB) & Oversold (OS). And the common strategy is to buy when RSI is in the Oversold region & sell when RSI is in the Overbought region. Different traders have different Overbought and Oversold levels. Some treat anything below 20 as Oversold, while some treat anything below 30 as Oversold. Similarly, some treat anything above 80 as Overbought, while some treat anything above 70 as Overbought. But the philosophy remains the same that is to buy when Oversold sell when Overbought. A major problem is that RSI in the Overbought or Oversold region can remain there for a long time. Remember, OB represents strength, not weakness & OS represents weakness, not strength. Even regular bearish divergences that come above 70 & regular bullish divergences that come below 30 don’t work satisfactorily. It’s normal for a bullish trend to have regular bearish divergences & a bearish trend to have regular bullish divergences. They’re not necessarily reversals. They can just be halts before trend resumes. Think of RSI in terms of Zones rather than looking at absolute values. 20-60 can be termed as Bear Zone, 80-40 can be called Bull Zone and 40-60 can be called Neutral Zone. What’s more important than RSI’s absolute value is that where it is coming from. So, if RSI is 50, we don’t know whether it is in Bull Zone or Bear Zone unless we know whether it came to 60 from below or above. Notice that Bull Zone is mentioned as 80-40 & not as 40-80. It means that if RSI is at 70 or 80, which is Bull Zone, then RSI will remain in Bull Zone till 40 in case of a correction. Similarly, if RSI is at 20 or 30, which is Bear Zone, it will be said to remain in Bear Zone till 60 in case of a bounce. Note that 40-60 is common to both Bull Zone and Bear Zone, hence it’s termed as Neutral Zone. During trading ranges, RSI tends to oscillate in the Neutral Zone. So, if RSI is 70, don’t blindly assume that it’s a short opportunity. RSI and price can fall a little to correct the Overbought situation and then the trend may resume again. Always think in terms of Zone-Shifts. This extremely useful indicator has been featured in countless articles, books, and interviews over the years and it continues to grow in popularity. It gives a relative evaluation of the strength of the recent price action of a particular security which makes it a good momentum indicator. The values range between 0 and 100, and the default time frame for comparison of the upward price change and the downward price change is 14 (as in 14 previous price candlesticks). The wiki RSI indicator page states that this is a fundamental part of technical analysis and this has proved very true for a lot of traders. RSI is available as an indicator for MT4 charts. The indicator, once selected, can be placed above, below or behind the underlying price charts on the MT4 platform. Long side play is when the price has been in an uptrend and RSI has been above 60 before the support got broken. Then RSI falls to 40 on the break of support and takes support. Wait till price forms a reversal candlestick/pattern and go long. Short Side play is when the price has been in a downtrend and RSI has been below 40 before resistance got broken. Then RSI rises to 60 on the break of resistance and faces resistance. Wait till price forms a reversal candlestick pattern and get short. If the price has been in a downtrend and RSI has been below 40 before resistance got broken. Then RSI rises above 60 on the break of resistance. Long on a pullback when price makes a reversal pattern and RSI takes support at 60. Sometimes RSI can correct till 50 after breaking above 60. Sometimes RSI can go up to 60 after breaking below 40. Which Markets Can RSI Be Applied To? RSI is a technical tool that can be applied to virtually every market to bring more of an edge to trading strategies, but it is more commonly used in the larger and more liquid markets like stocks, commodities, and forex. Extended trends can keep the RSI in overbought or oversold levels for a long time. And although these seem like ideal places to enter the market when price retraces, It’s also important to not focus solely on overbought and oversold values as this could prove counterproductive in a strong trend. The RSI (like all oscillators) has a center line. Often times this is forgotten when comparing to the indicator itself. The center line is in the middle of the range at the 50 level and can be used to show shifts in the trend. Momentum is considered up if the RSI is above 50 and down if it’s below that mark. The RSI default setting is 14. This means that in creating its reading, it takes into account the last 14 bars of whichever chart you’re looking at. This may not always be the best setting for your trading. For example, short-term traders use smaller periods while longer-term traders usually opt for higher periods. Divergence occurs when the movement of the price of a stock, forex, future or option is in opposite direction with the movement of an indicator. Indicators are usually used by traders to source additional confirmation for the market trends. Traders should, therefore, use the price of the security itself while determining the market trends. There are several types of indicators which include Relative Strength Index(RSI), Stochastic indicator, Moving Average Convergence Divergence and Commodity Channel Index. Divergence has several benefits. It guides traders in spotting potential reversals in the market by comparing price and indicator movements. It also assists traders in making strategic decisions such as whether to sell or hold onto a stock or buy a stock. Relative Strength Index (RSI) divergence refers to the disparity between price actions high and lows and the relative strength index. Stocks are usually plotted on a scale of zero to a hundred (0-100). This is because the large movement of prices can create false or misleading buy or sell signals. When the stock falls below 30 it is said to be oversold while if it rises above 70 it is said to be overbought. Reversals usually occur at these levels. These are Regular Divergence and Hidden Divergence. While trading in divergences, traders usually buy closer to the bottoms and sell near tops in order to lower the level of risk of the trading securities in relation to the rewards. In this divergences, we also have bearish divergence and bullish divergence. A bearish divergence occurs when the price of a stock makes a new high while the RSI makes a lower high. This usually indicates a sell signal. Bullish divergence, on the other hand, is when the price of a financial security makes a new low while the RSI, in turn, makes a higher low. This is usually an indication of a buy signal. Let us review them in detail relating to the Relative Strength Index. There are two types of divergences here which are bullish regular divergence and bearish regular divergence as earlier stated above. The regular divergence usually occurs at the end of the bullish trend. In the bullish divergence, the price is making lower lows while the Relative Strength Index is recording higher lows. This indicates that bears are getting exhausted while the underlying strength of the trend is building up. When a breaking point occurs in this scenario the downtrend automatically turns to the uptrend. In addition, if another top is made, prices fall to the downside and new structures can be put leading to a reversal trend. In bearish divergence, the price of the security is making new higher highs while the RSI indicator is recording lower highs. This clearly indicates that the underlying weakness of the trend is forming and due to this the uptrend is changing to a downtrend. In hidden bullish divergence, the stock prices are recording higher lows while the RSI is recording lower lows. This is an indicator that the RSI is oversold and that the underlying strength of the market trend is coming up. In the hidden bearish divergence, the stock price is trending down recording lower highs while the RSI is spotting higher highs. This is an indicator that the RSI has been overbought therefore traders should sell stock. When the underlying prices reach a new high or low that the RSI doesn’t confirm, then that divergence could be a signal of price reversal. For instance, when the price hits a new high but the RSI doesn’t, that can be a sell signal. Conversely, the same is true for buy signals. It’s important to note, however, that sometimes divergences can be misleading in a strongly trending environment. For example, a bullish trend can show a lot of bearish divergences before the top appears. In the same way, bullish divergences can materialize in a strong downward trend but the trend continues down anyway. Whenever the RSI shows a lower high followed by a downside move that goes below a previous low, this indicates a Top Swing Failure. In the same way, if the RSI makes a higher low followed by a move up above a previous high, then that signals the occurrence of a Bottom Swing Failure. Failure swings are considered to be strong indicators of imminent reversals. They are independent of the price movement, which means that they focus only on the RSI (and not on divergences) for signals. It will become more clear in the figure below. Other Tools To Use With The RSI Indicator? Because the RSI is simply a measure of the relative strength of the market, it is best to incorporate other tools when identifying reversals using RSI. Other tools that can be used in conjunction with the RSI indicator are candlestick analysis and trend line analysis. As an example, if you see a reversal candlestick right next to a trend line and the RSI is diverging at the same time then that could be the generation of a trading signal. The trend line support or resistance usually coincides with the levels of support or resistance in the RSI reading. Big, sudden price moves can generate false RSI buy or sell signals and so it’s best to use it with refinements to its application or to use it together with other technical indicators for confirmation. One way of doing this is to watch for divergences between the RSI and the price. For traders who want to make a lot of little trades throughout the day, such as scalpers, it may be beneficial to look into AFL when using RSI for trade entries. The Relative Strength Index is a versatile momentum indicator that has stood the test of time. Markets and volatility have changed over the years but the RSI is still as relevant today as it was when Wilder first came up with the concept. Other great traders have added to the way it is used and understood over the years which has only made it even more popular. If EPS is 8.98,9.87,12.12,15.78 from March 2014 to March 2017. Assuming the last 3 years growth to continue in the current year also, what would be the EPS and PEG?